Scooters come in various styles such as the tricycle style that has three wheels or the conventional style where the rider keeps both feet on a stand in the middle of the scooter. Conventional kick scooters have two wheels and they are not suitable for youngest kids. Tricycle style scooters are safer and meant for beginners as they provide more stability. Some kid scooters feature handles that look more like those on bicycle handlebars, while some are fitted with handlebars that project directly from the front post. The two options are equally safe and choosing between them is just a matter of preference. Low deck for easy scooting! Large wheels for smoother ride! 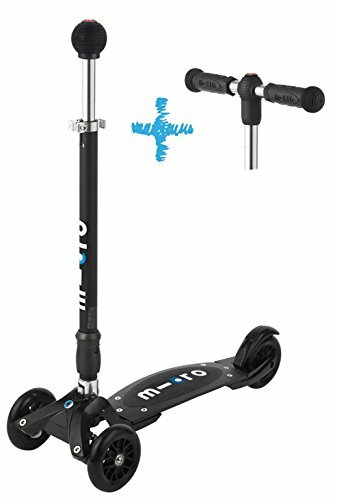 Kick scooters are available in multiple sizes. The sizes accommodate specific weight ranges and heights. 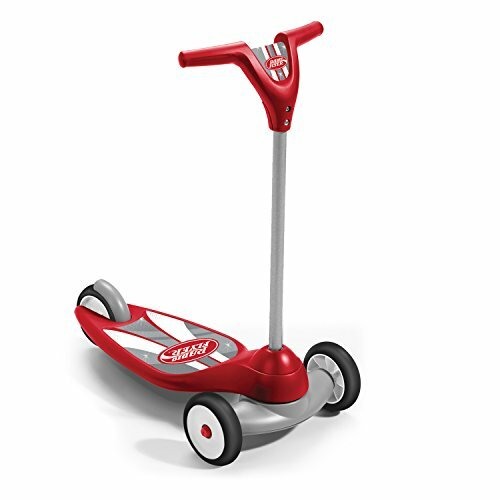 Kick scooters for children can accommodate weights of up to 50 pounds and are available in aluminum or a combination of plastic and aluminum. Aluminum models are usually more expensive than aluminum-plastic models but they are more durable. This has much to do with the available space in the household. Where space is limited, it would be advisable to go for a folding scooter which can be stored in smaller spaces. This is contrasted with scooters that come with rigid bodies and therefore, need to be stored in an upright position. However, solid scooters are more durable compared to foldable ones. Swiss-designed with Interchangeable Handlebar - switch from Joystick to T-bar with ease! The platform ought to be roughened to prevent slopping. 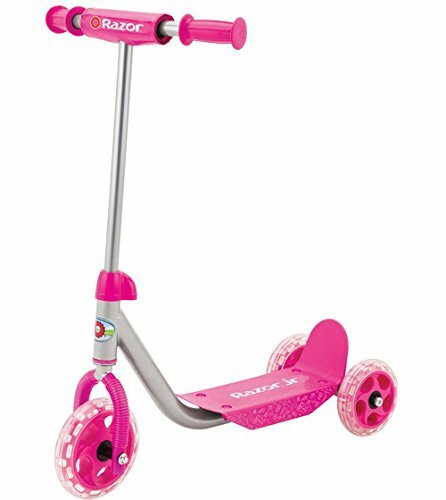 In addition, a scooter with a broader base is better suited for beginners and toddlers as their maneuverability is lower. The length of the platform is also important since the longer the platform the more difficult it is to control the scooter. Plastic scooters are light and are normally designed for children under two years of age. They are not durable and as such, not a perfect choice especially for children who can already drive actively. 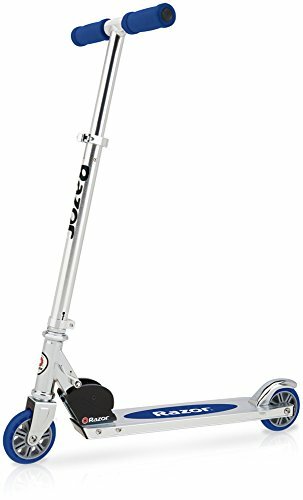 A metal scooter would be better suited for children over 3.5 years. The best option is a scooter made of an alloy of aluminum and steel. 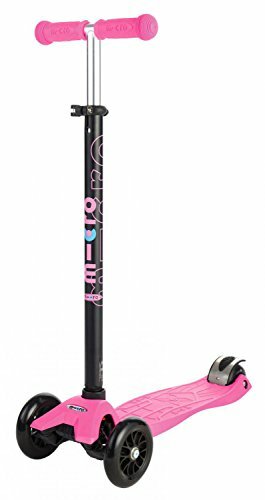 Buy a kid’s kick scooter with handlebars with grips to avoid slipping off the hands. The best handlebars are normally made of foam rubber which absorbs sweat and is comfortable to the hands. Since children are growing fast, it is important to choose a model with adjustable handlebar position. Kids Kick scooter models with breaks above the rear wheel are relatively safer compared to those with front brakes. Accessories are another way to add a pop of color or style to a properly working scooter. In some cases, a part on a scooter could wear out requiring replacement. Children’s kick scooters need to be in bright colors together with reflective elements to make the rider more visible to other road users. A good scooter for a child is one that is suitable to the height of the child since improper posture is likely to hurt the child. In conclusion, although there are multiple factors you should consider when buying a kick scooter for your kid, safety of your children is paramount. As such, the safety of the kick scooter in question should be the main consideration in your purchase decision. We invite you to browse through our site and learn more on the best kid kick scooter option.